Coconut palms line the sea shore, the countless lagoons and backwaters and populate the landscape of Kerala like a mammoth standing army. Is it any wonder then that the bounty they yield complements the delicious gifts that the sea bestows on this rich land. 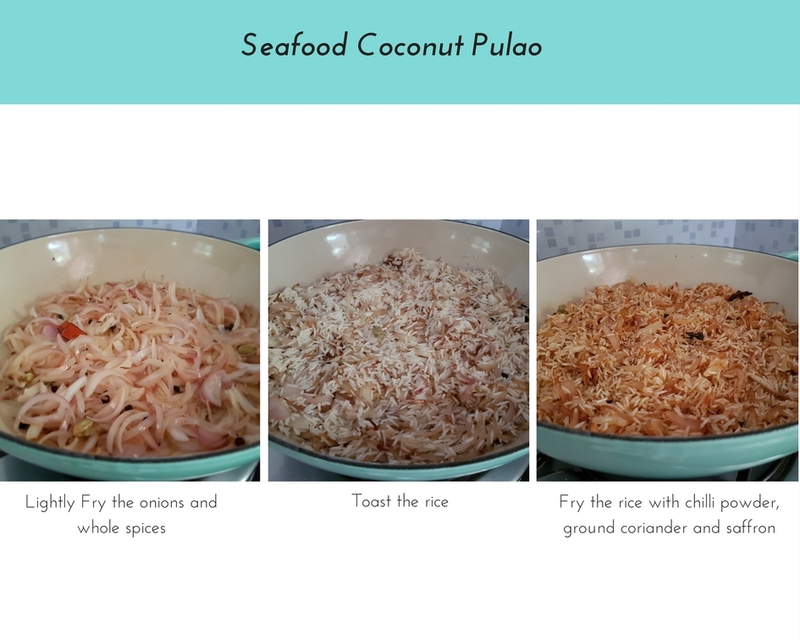 Seafood and coconuts – a match made in foodie heaven – inspired me to develop a pulao recipe that is as easy as it is delicious. This is a pulao recipe, not a biryani. There are fundamental differences between the two. Biryanis are more heavily spiced while pulao recipes use spices with a lighter hand. Technique-wise, the rice, meat/vegetables and spices are sauteed and cooked together in a pulao, while making a biryani means cooking the rice and meat separately and assembling them in layers for the final step of cooking. It’s true that both pulaos(pilafs) and biryani came from the Middle East to India; here, they were refined with the use of numerous spices and techniques and gradually evolved in countless royal kitchens to become the technically sophisticated and fragrantly delectable dishes that we know today. While the biryani is the big daddy of Indian cuisine, the pulao has a delicate charm and an elegant simplicity. Like the quietly luminosity of a single string of pearls, rather than the hard brilliance of a cluster of diamonds. 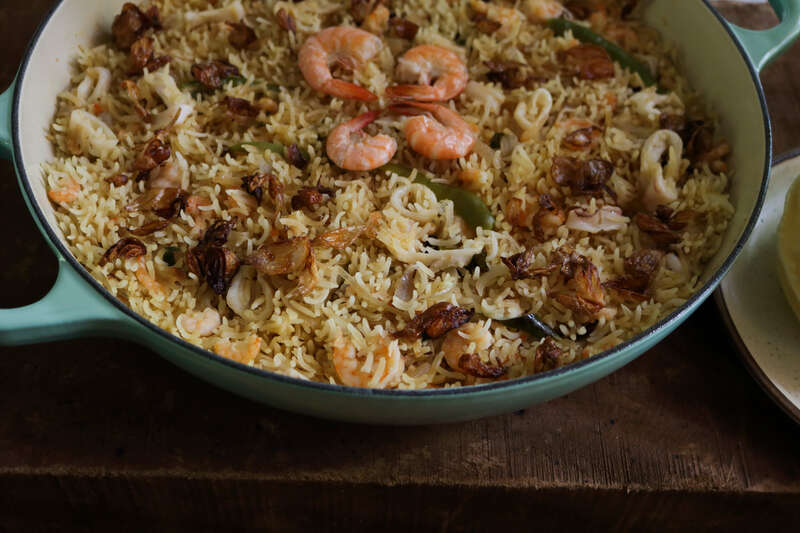 This pulao recipe captures that understated beauty with the gentle touch of coconut milk, the subtle sweetness of fresh seafood and the understated presence of whole spices, as opposed to the use of robust masalas or spice pastes. 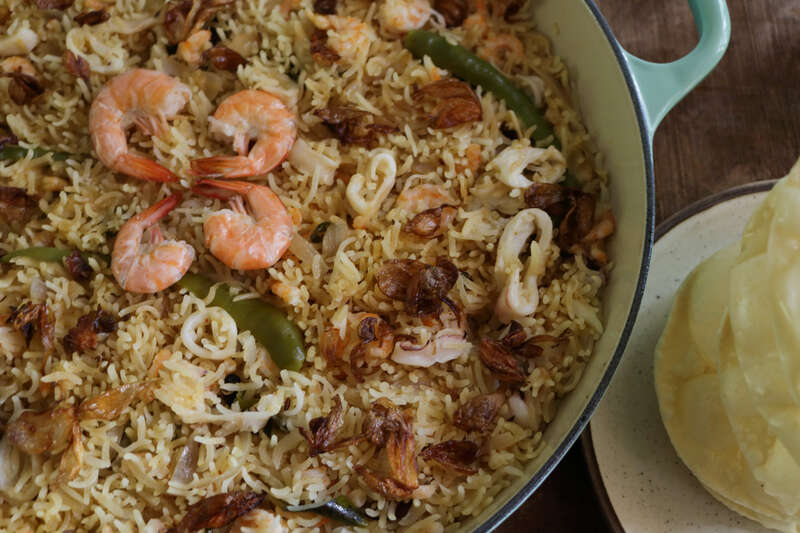 In my pulao recipe, I have used only prawns (shrimp) and calamari because my husband doesn’t eat fish, but I recommend adding chunks of any firm, white fish to enhance the taste of the sea. Mussels and clams would work as well. The coconut milk can be fresh or come out of a tin, both produce equally good results. 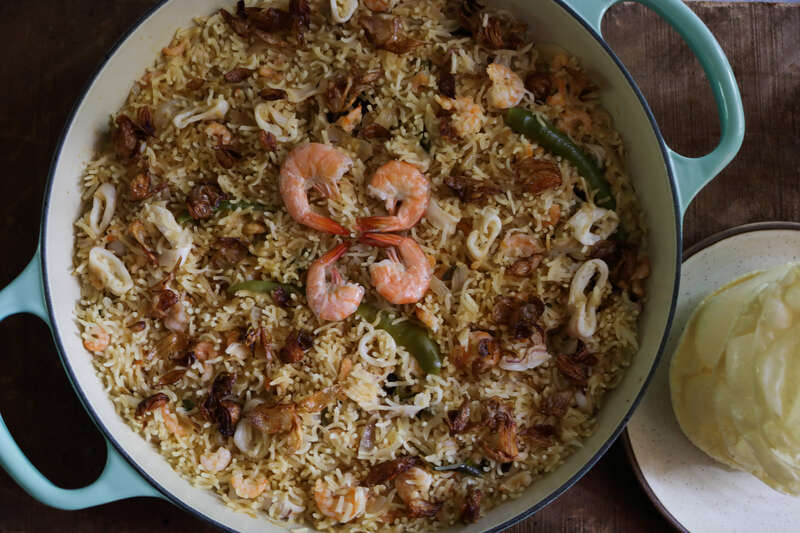 The only two things that really need your attention are the cooking of the seafood and the toasting of the rice before you pour in the liquid to cook the pulao. Seafood, as you know should not overcook and disintegrate, so add it only when the pulao is almost done (in the last 7-10 minutes of cooking). And don’t worry about it being under, because once the heat is switched off, the pulao must rest, covered for 10-15 minute. You can be sure that the steam and heat in the closed pan will cook any prawns or fish that may need a little more time. The latter will decide whether you get a mushy, risotto-like texture or whether the grains of Basmati remain loose and fluffy, as they should be. Be patient while frying/toasting the rice with the onions on low heat, and you will have the perfect pulao. In the picture below, I have tried to show how the rice would look once done. Also, use a flat, wide pan somewhat like a paella pan; it will help the pulao to cook quickly and evenly. This is a stress-free pulao recipe that doesn’t ask for too much chopping or grinding. Make it on a Sunday as a one-pot, family-style lunch or as the main course for a small dinner. I served it garnished with deep fried shallots which add a crunch and oniony depth. I recommend you do the same but you can leave it out if it’s too much work. A coastal pulao fragrant with Basmati rice, coconut milk and whole spices and dotted with succulent nuggets of seafood. Wash and soak the rice in a large pot for 20 minutes and then drain completely to remove all water. Before you start the pulao, deep fry the shallots in a small pan of oil, drain and set aside. These can be stored in an airtight box for a few days. Put a wide, heavy-based skillet or pan on medium heat, pour in the ghee and 3 teaspoons of the onion oil from the fried shallots. When the oil is hot, throw in the whole spices and let them pop and fry for 10-15 seconds. Add the sliced onions and fry gently till golden (not brown). Toss in the garlic and ginger and fry for a minute more. Now add the drained rice and continue to saute, stirring frequently to coat the rice with the ghee. Fry the rice for 5-7 mins on low heat till lightly toasted. Season with the ground spices, saffron and salt and fry for 30 seconds more. Put in the green chillies and curry leaves. In a jug, combine the coconut milk and water and mix. Pour half of it into the pan and bring to a gentle simmer. Cover and let the rice cook on low heat checking once every now and then if more liquid is needed. Cook for 15 minutes (the rice should be 70 per cent done by now). Gently, without breaking the grains, mix in the seafood and the remaining liquid. Check for salt, correct, cover and cook for a further 10 minutes. Once all the coconut milk has been absorbed and the seafood almost done, turn off the heat, cover the pan and keep aside. Before serving, lightly fluff up the pulao with a fork, and sprinkle with the fried shallots. The amount of liquid is approximate. Depending on the variety of Basmati, you may need a little more or less. Lovely dish — tons of flavor in this. Really like the shrimp and coconut, too. Thanks! This does sound like a wonderful dish. In Spain, last year, my husband and I took a cooking class for Paella and it was lovely. One of the things I adore about paella is that crisp rice bottom from not stirring the dish after the liquid goes in. Something like a BiBimBap, that crunch rice is so moreish! i haven’t had pulao before, but this sounds delicious! lots of spice appeals to me in the colder months, but the lighter spices sound perfect for these sticky hot days. This would be my perfect lunch recipe! Can’t wait tot try it! Oh I love this dish and the method that you cooked the rice and ingredients, very nice. Also enjoy your writing style, take care. Looks so tasty! thanks for sharing your recipe! This will make a beautiful Sunday meal! I actually don’t have any pulao recipes in my repertoire, so definitely pinning this one.